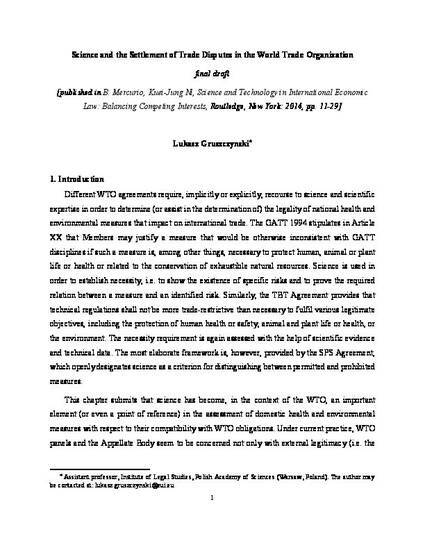 This chapter submits that science has become, in the context of the WTO, an important element (or even a point of reference) in the assessment of domestic health and environmental measures with respect to their compatibility with WTO obligations. Under current practice, WTO panels and the Appellate Body seem to be concerned not only with external legitimacy (i.e. the absence of alternative less-trade-restrictive measures that could meet the health policy objective), but also with the internal legitimacy of domestic measures (i.e. the existence of a scientific basis). This sharply contrasts with the approach taken under GATT 1947, where panels tended to concentrate only on the first element. This chapter also suggests some reasons that could explain such a shift. In particular, it is argued that, besides the need to guarantee the consistency of different WTO agreements and the increased legalisation and formalization of the WTO dispute settlement process, the legitimizing character of science is also an important factor.